How Might We Change the World as We Know it? Systemic global challenges present serious threats to our world—from a rising tide of isolationism sewing cultural discord and division to global climate change dismantling communities at each rung of the socio-economic ladder to a widening income inequality that is exacerbating poverty, while limiting opportunity among many generations. Historically, large scale development initiatives have attempted to address issues such as these through projects that are robustly funded and attempt to reach as many underserved individuals as possible with often pre-determined solutions. It’s become evident that, while well-meaning, this approach can have unintentional negative consequences and squander an increasingly scant fountain of public sector resources. 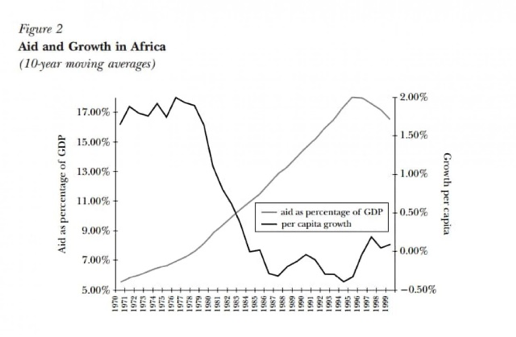 As just one example, looking back at the soaring levels of foreign aid administered to African governments in the 1980s and 1990s, one can easily see in the chart below from economist William Easterly that these economies were doing worse than ever. Trying to help poorer countries, the foreign aid community may have actually contributed to the problems facing many African nations by slowing economic growth and contributing to government corruption. It certainly is a frustrating position to witness a massive, seemingly intractable social challenge and not be able to take immediate action. PYXERA Global offers the conceptualization of “solvable problems,” framed within the context of the United Nations’ Global Goals. The broad reach of the Goals often leaves individuals, organizations, and governments wondering, “Where do we begin?” So often today, efforts to address the world’s challenges result in a hundred drops in a million buckets. Those hundred drops may be individually meaningful, but they do not amount to systems change. They cannot tangibly solve problems. Campaigns focused on eradicating extreme poverty, improving education, and eliminating hunger present grand visions of a thriving world, but they lack problem definition. We believe that starting with specific, solvable problems, within the context of these Goals, offers a path forward to create enduring, systemic change. Solvable problems are social challenges for which there are known and tested solutions. Certain global challenges can be distinguished as solvable because we’ve seen them successfully resolved on smaller scales. Pursuing a more limited set of solvable problems ensures efficient resource allocation and leads to sustainable systems change. It is possible to embrace these visions of prosperity, while still being utterly practical in defining core problems and seeking specific solutions. A present-day example arises in the challenge of global food security. Global Goal #2 promises, by 2030, to “end hunger, achieve food security and improved nutrition and promote sustainable agriculture,” surely all worthy objectives. The related targets narrow down the issue, yet are still extraordinarily expansive: end all forms of malnutrition, ensure sustainable food production systems, increase investment in rural infrastructure, and five other equally broad aims. Setting the stage this way provides too much room for interpretation and virtually ensures that resources are spread too thinly. Consider instead a specific problem that contributes to global hunger: post-harvest loss. This pervasive issue is largely invisible, and yet it consumes extraordinary resources—in land, water, fertilizer, labor, and capital—to grow food that is never eaten. One-third of all food produced on this planet is never consumed, while at the same time 1.2 billion people go to bed hungry or undernourished. Perfectly consumable food that either spoils or gets thrown away is enough to feed every hungry person in the world, with nearly 50 percent to spare. Waste—one-third of that unconsumed food—occurs at the back end of the food chain. Made up of the cucumbers that rot in our refrigerators, the spaghetti left on our plates, and the thousands of tons of untouched expired food thrown out by retail establishments around the world, waste is largely a problem of prosperity. In sub-Saharan Africa, 50 percent of all fruits and vegetables, 20 percent of all cereals, and 40 percent of roots and tubers are lost in substandard storage or transit, or simply left on the farm. Post-harvest loss is the tomatoes that spoiled on the vine, or on the truck that broke down in transport to market. It is the fruit that was grown by a smallholder farmer, but did not meet a company’s standards. It is the vegetables that ferment, only to become inconsumable because they did not make it to market due to a lack of roads and poor transportation. Yet, even with so much documented waste and loss, over the past 30 years, roughly 95 percent of all spending on food security has focused on improving farmers’ capacity to grow and harvest more. If these high rates of post-harvest loss persist, increased production will only continue to be negated by the underlying problem. Solvable problems exist within a system. To effectively address a solvable problem, examine the full system—the trends, patterns, and the systems structure. What is the relationship between seemingly disparate problems? How might we coordinate changes over time to produce a larger systems change? Who are the stakeholders and entities that influence the system most closely? How might we engage them? In the case of post-harvest loss, there are some proven models, including those being tested under Rockefeller Foundation’s YieldWise program, with whom PYXERA Global works in Nigeria as an implementing partner. These models are commercially viable and rely on mutually beneficial partnerships between the public, private, and social sectors. The public sector contributes to reduction of post-harvest loss through a variety of support measures, from infrastructure improvements to incentivizing financing mechanisms that bolster growth. The private sector actors include companies committed to sourcing from local famers, as well as secondary markets and ancillary support businesses. Social sector partners are valuable in their ability to build trust with farmers and communities, raise awareness of business opportunities, and facilitate capacity building and farmer aggregation activities. Under the YieldWise Nigeria program, PYXERA Global has adopted this type of systemic approach and has seen a dramatic reduction in food loss. Approaching the full system tackles not just one problem, but many, including economic prosperity and poverty. To date, nearly 110,000 metric tons of tomatoes that would have otherwise likely been lost have been purchased by traders, markets, and processors across Nigeria from the project’s nearly 26,000 farmers. This totals approximately $13,000,000 in sales. Of those 26,000 farmers, nearly 18,000 have been trained on post-harvest loss reducing practices and technologies. And finally, recognizing the real cost of lost produce, 22 value chain actors have begun incorporating post-harvest loss metrics into their regular business operations. PYXERA Global has seen progress in its overarching goal to catalyze an enabling environment for post-harvest loss reduction in which all value chain actors, especially the Government of Nigeria, feel empowered to tackle this solvable problem from within. In every problem lies an opportunity. The tools, practices, and resources exist. What is needed now is leadership, vision, collaboration, and resources from the public, private, and social sectors, and a clear commitment to move forward. It requires the focus and collective internal fortitude to stick with one, sometimes tedious, problem until it is solved. It will be complex. It will be expensive. It will be difficult. It will sometimes be politically messy. On October 10–11, PYXERA Global will convene an invite-only event, the Global Engagement Forum: Live, to address four big solvable problems: reducing post-harvest loss, reducing marine debris and ocean plastics, ending energy poverty, and closing the skills gap in STEM. Leaders and experts from across the private, public, and social sectors, will come together for two days of intensive collaboration. The Forum contributors will bring resources to these problems—whether it is knowledge and expertise, networks and influence, technical prowess, or financial and human capital. Each has a vested interest in solving one or more of these pressing challenges. Join me and others as we tackle these solvable problems together, and possibly change the world as we know it. About the author: Deirdre White is a globally recognized leader in building tri-sector partnerships to address the world’s most pressing challenges. As CEO of PYXERA Global, she has led the transformation of the organization to one that maximizes impact through strong and strategic partnerships.